Just about the time Rose was promising Jack she would never let go, the United States banned what had been one of the most popular drinks in the world: absinthe. In 1912, the Titanic sank and the U.S. Food and Drug Administration banned the importation of absinthe, a licorice-tasting, somewhat bitter, high-alcohol-proof aperitif that had been the Belle of the Belle Époque in Paris and the source of much controversy. Absinthe, also known as the Green Fairy, was reputed to have hallucinogenic properties and in the late 1800s and was the favored drink of the creative class. Artists Picasso, Degas, Toulouse-Lautrec and Manet were all under the spell of the Green Fairy and painted major works showing the effects of absinthe on its drinkers. Van Gogh is rumored to have cut off his ear after drinking absinthe. The flamboyant writer Oscar Wilde was a devotee of la Fée Verte as were American expats on the continent. Absinthe started life as a medicinal elixir, a concoction of grande wormwood (Artemisia absinthium), a shrub that grows wild throughout Europe, and herbs such as sweet fennel and green anise. The leaves and wooded stems of the plant produce a bitter substance used to cure intestinal worms, aid in childbirth and even induce love. Relatives of grande wormwood include tarragon and American sagebrush. Vermouth, from the German word Wermut or wormwood, was originally made with this plant. Absinthe first grew in popularity during the 1800s when it was used as a water purifier for French troops in Northern Africa, then as an inexpensive drink in the late nineteenth century. At that time the French wine industry was decimated with spread of phylloxera, a louse that killed grape vines. As wine prices skyrocketed, the French turned to absinthe. The drink was at first embraced by the Bohemian culture, then the population at large. In the United States, Americans had an array of legal opiates to choose from in the 1880s, including laudanum, a opium alcohol mixture. Swiss- and French-imported absinthe was particularly popular in New Orleans, and in 1878, 8 million liters of absinthe were imported into the United States. Absinthe was thought to bring a clarity of thought -- a new way to see ordinary objects. Thujone, a toxic chemical found in wormwood, was said to be responsible for absinthe's reputed mind altering effects. Furthermore the elevated alcohol content (50 to 70 percent) of absinthe was thought to induce alcoholism. As the French wine industry returned to strength in the early 1900s, coincidentally with the surge in the temperance movement, absinthe became a victim of a "reefer madness" mentality. When a Swiss man murdered his family in 1905, absinthe was found to be the precipitating culprit and the Swiss subsequently banned the drink. The United States followed suit, and France banned absinthe in 1915. Some countries, notably Great Britain, Spain and Portugal, never banned absinthe. The following decades left Americans heading to Mexico or the islands in search of absinthe. But by the close of the 20th century and the birth of the European Union, a revival occurred in the production of absinthe -- this time with minimal, only trace-like amounts, of thujone. Earlier this year the U.S. Food and Drug Administration lifted the ban on some brands of absinthe. Three absinthes, Lucid (a $60 750-milliliter bottle with green eyes) and two from Kübler, including the 53 proof from this legendary Swiss house in Val-de-Travers where absinthe was first created, were approved by the Alcohol and Tobacco Tax and Trade Bureau in March 2007. Each contain less than 10 parts per million of thujone. Another approved brand, Green Moon, is a premium French vodka blended with southern wormwood (Artemisia abrotanum). Absente (without the H) Absinthe Refined (110-proof, $40 for a 750-milliliter bottle often packaged with an absinthe spoon) has been sold in the United States since 1999. This liquor is made from southern wormwood as well. Experts argue whether southern wormwood produces the taste of a true absinthe made from grande wormwood. Drinking absinthe, like tequila, demands specific rituals. Due to the high alcohol content, cold water is necessary to make it palatable. Absinthe fountains were common fixtures in the Parisian bars and cafes of the 1880s. This ornate vessel holds crushed ice and water in the center compartment with four taps. Several drinkers could louche their drinks simultaneously -- almost ceremonially. Louching, or adding water, technically reinstates some ingredients that had been dissolved in the alcohol. When absinthe is louched, the pale green alcohol clouds into an opalescent seafoam green. Louching is also done with pastis (Pernod), arak and ouzo -- all licorice or star-anise tasting alcohols. 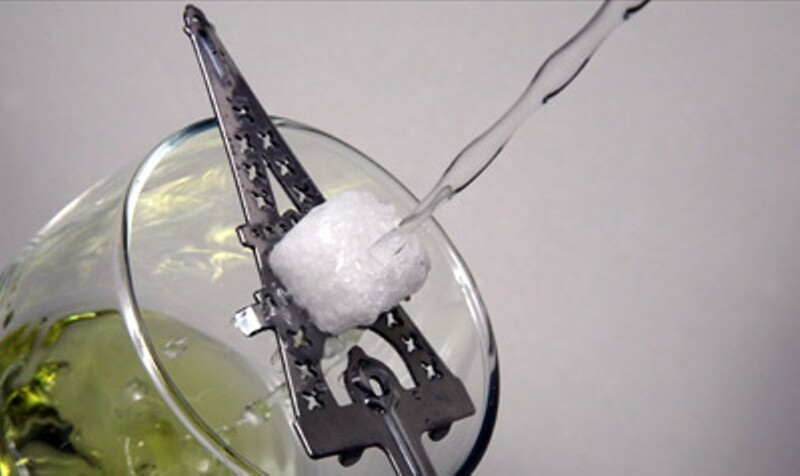 For individual drinking, a two-part absinthe glass is used with the ice in the top sieve portion. Other glasses were made specifically for absinthe with indentations or marks for the pour. Many of these are being reproduced. Before the water is added and to sweeten the bitter taste, cubed sugar is placed atop a perforated spoon. Three to five parts water cold water is dripped to dissolve the sugar and dilute the alcohol. In Czechoslovakia, absinthe is flamed to caramelize the sugar; however, few connoisseurs -- or bar owners -- believe it is a safe practice to expose 70-proof alcohol to fire. One of Ernest Hemingway's' favorite drinks in Spain (where absinthe remained legal) was Death in the Afternoon, an absinthe Champagne cocktail ,which he contributed to a celebrity cookbook in 1935: "Pour one jigger absinthe into a Champagne glass. Add iced Champagne until it attains the proper opalescent milkiness. Drink three to five of these slowly." Stop when you see green fairies.